Perhaps part of the Gaucho Saddle mystique or gaucho clothes can be attributed to the larger than life status that South American natives have bestowed upon these individuals. There are working gauchos who are employed by large cattle ranches in Uruguay, Brazil and Argentina but it is the earlier gauchos that still attract much of the public's interest. The life of el gaucho was embraced by a large number of men beginning in the late 16th century. These were individuals who felt compelled to follow their own paths, and march to the beat of different drummers. Independence and a sense of adventure led these people to a new life without the encumbering rules and restrictions of everyday society. The saddle of a Uruguay gaucho is often considered to be one of the best designed, equine accessories around the world. These are saddles that have been created to give the rider more efficiency and effectiveness atop the horse. 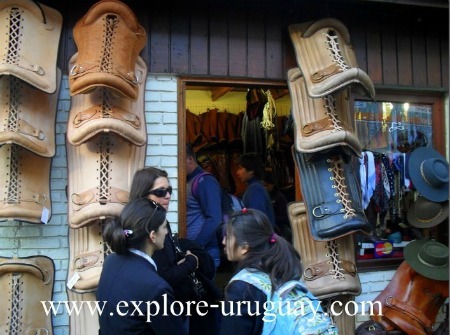 Many of the tourists who travel to Uruguay, Argentina, Brazil, Peru, and Chile also spend long hours searching for items that can be directly linked to 18th or 19th century gauchos. In many ways these historic items are proving to be more valuable than a number of early Western cowboy accessories. A gaucho saddle is simple in design but it serves the purpose for which it is intended. During earlier times these horse saddles were meant to function as beds for the nomadic Uruguay gauchos. All they needed to do is to remove the saddle and arrange it on the ground whenever a few hours of sleep were needed. You may hear this type of saddle referred to as a recado crillo. often braided together to provide the rider with an easier grip. The gaucho saddle employed by the working Uruguay gaucho usually had a plain design, but a special saddle might have metal and silver included as decorations. Today some of the modern South American saddles even have breastplates, spurs and bridles that are crafted from silver. A defining feature that distinguished a gaucho saddle was the use of the long pointed saddleblankets that stretched out away from the rider. This helped protect the South American cowboy from accidental injury when riding through thick brush or tall, grassy areas. In addition to heavy leather saddleblankets the gaucho would be dressed in leatherboots and wide chaps made from cowhide. Leather plates would be placed around the chest of the horse to help protect the animal from the stiff thorns and sharp edged grasses that might be encountered. Horse saddles are a major draw in today's huge collector's market. In addition to western styled saddles, Spanish saddles and gaucho saddles, investors and savvy collectors search for other authentic accessories such as gaucho boots, gaucho bags and antique gaucho knives.